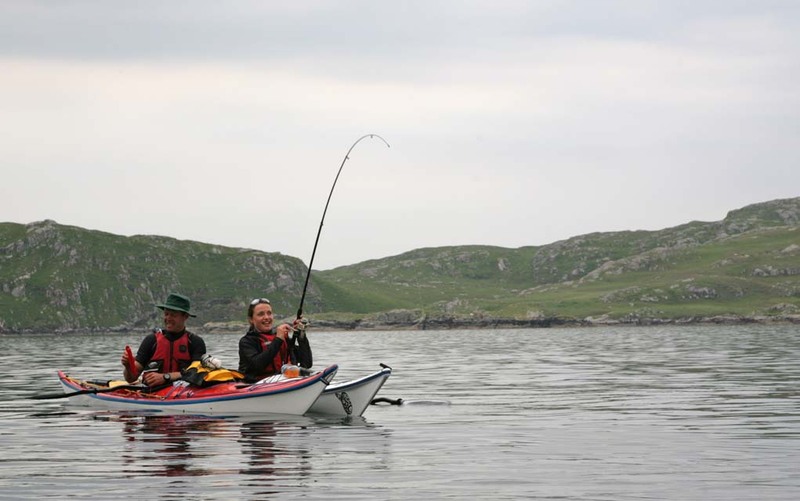 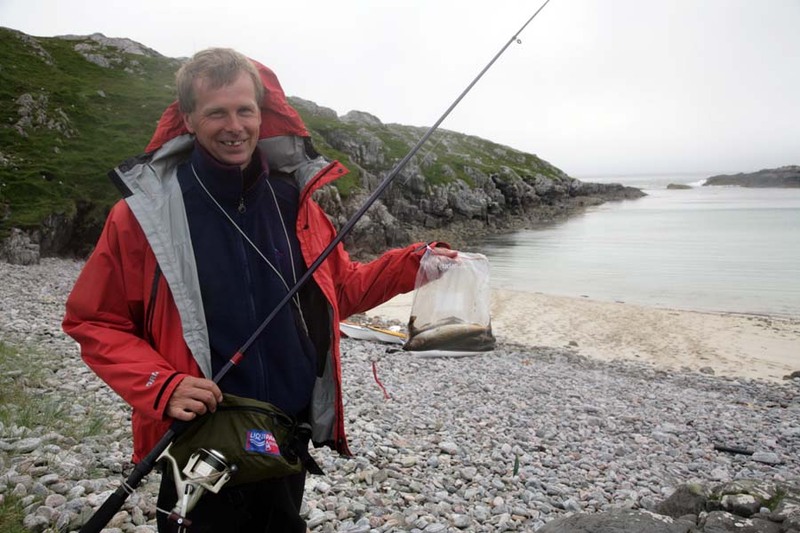 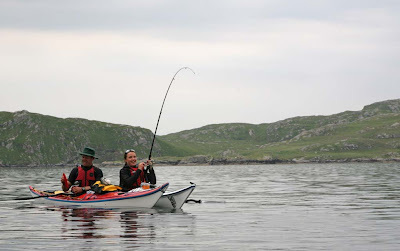 Of course sea kayaking takes you some great locations where you can fish from the shore and then a full size rod is an even greater advantage than a hand line. However, a full size rod can be a handful to store assemble and catch fish on a kayak so I have stuck with my hand line until now. Tony caught the top three mackerel. I caught the bottom one! It was time to get some new gear. So I got some advice from Dave Dominy at AB Fishing Tackle. He suggested their kayak fishing starter kit. 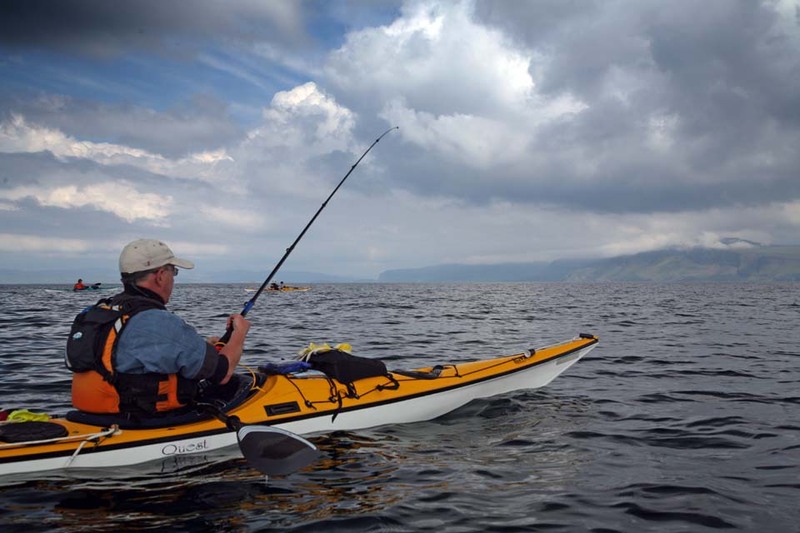 This has a very short one piece fibreglass rod, the Zebco Kayak King. 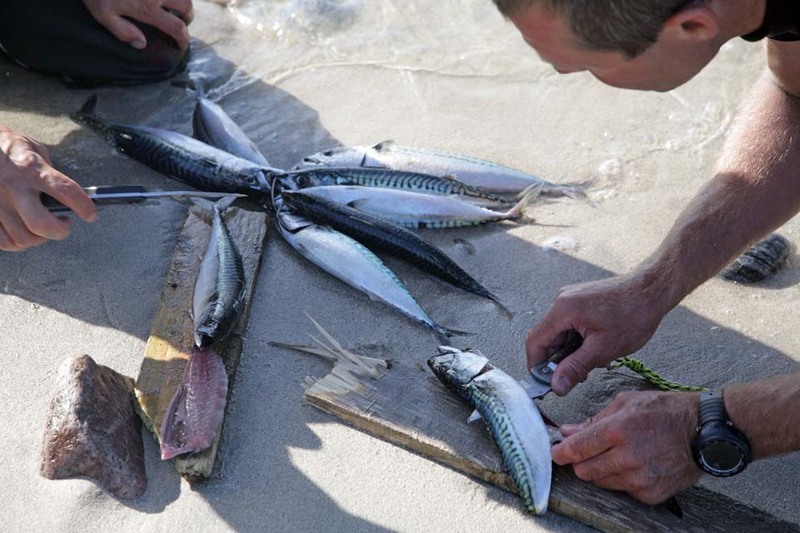 It is coupled with an Abu Blue Max multiplier reel and comes with jiggers, lures and line. I found the multiplier reel more difficult to learn than a spinner. 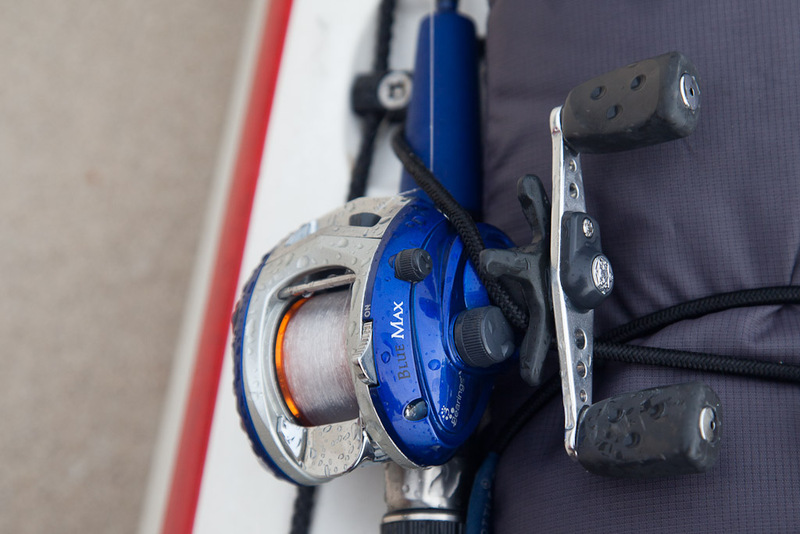 This one has a magnetic brake and a friction brake to control over run of the reel and the inevitable bird's nest of line. 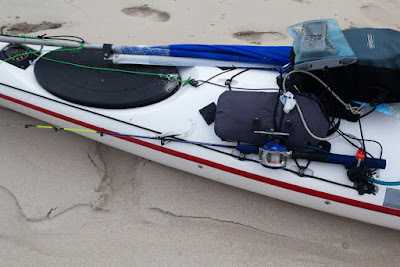 The magnetic brake works well but I couldn't see much effect of the friction brake. 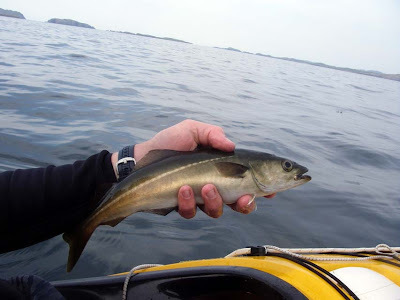 I learned to use my thumb to create a little braking effect on the reel and I have been surprised how effective this little rod is at casting from a kayak. If I want to do some trolling, I simply stuff the rod handle down the front of my BA and paddle/sail away. 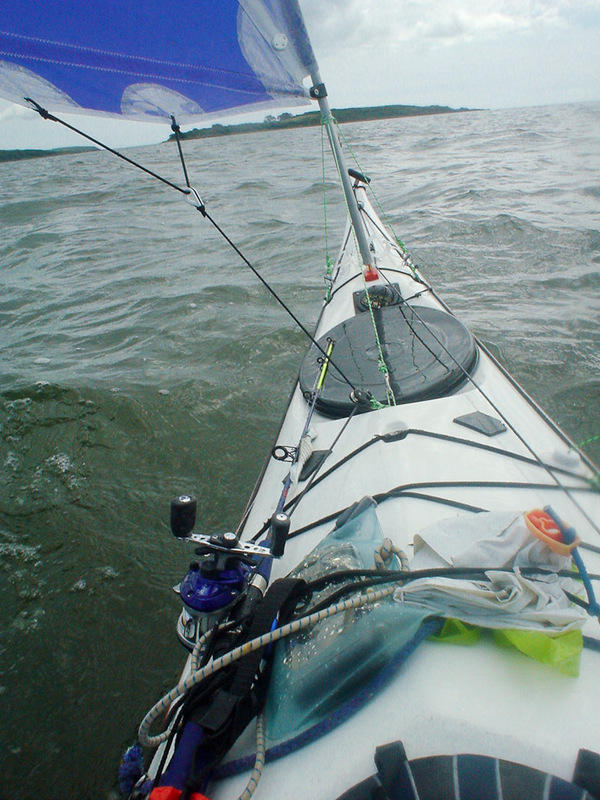 It stows really easily on the foredeck, even sharing space with my Flat Earth kayak sail! 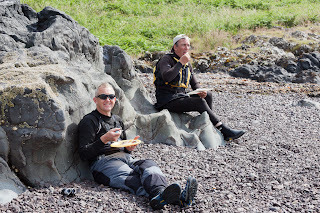 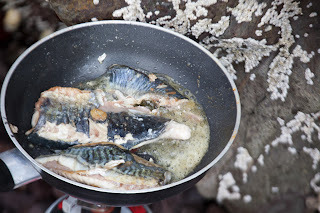 I am particularly fond of fresh mackerel and have found that a good time to catch them on the Solway is about an hour into the ebb tide off the headlands on the islands at the mouth of Fleet Bay. 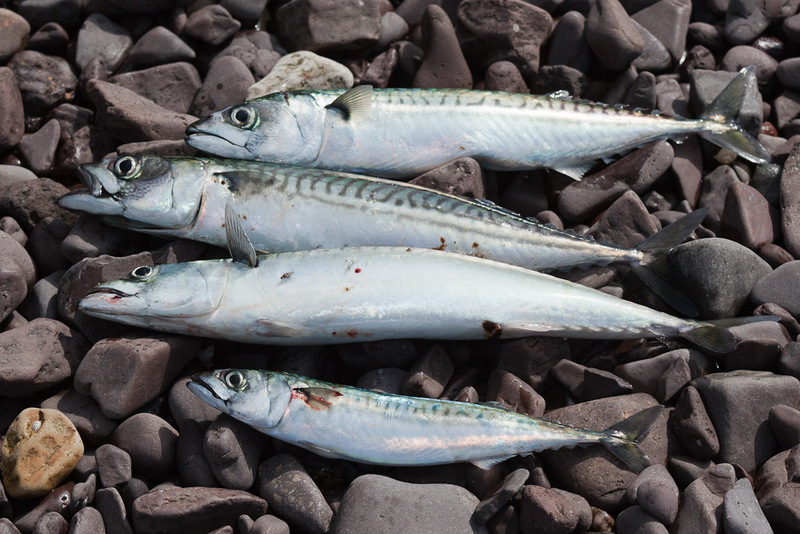 July is the peak month for mackerel in these parts. 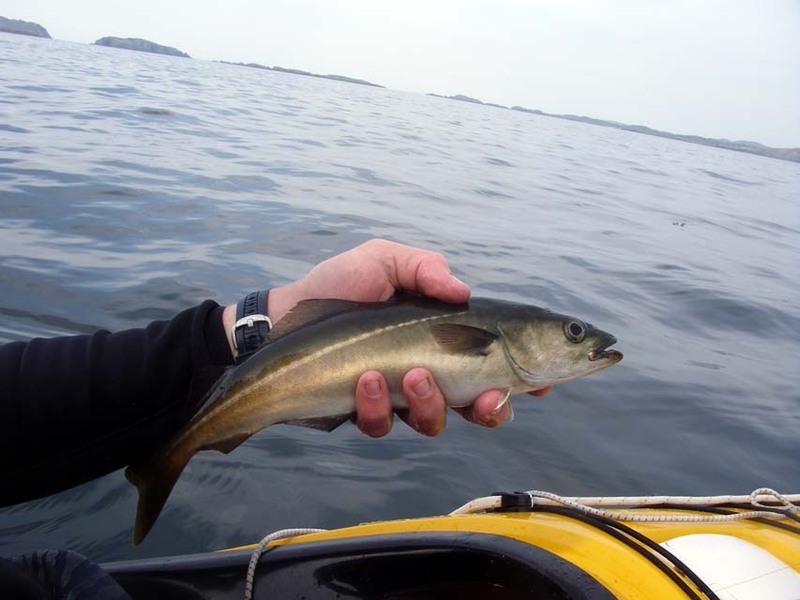 First time out with the rod, I caught a mackerel straight away at about 7m down. 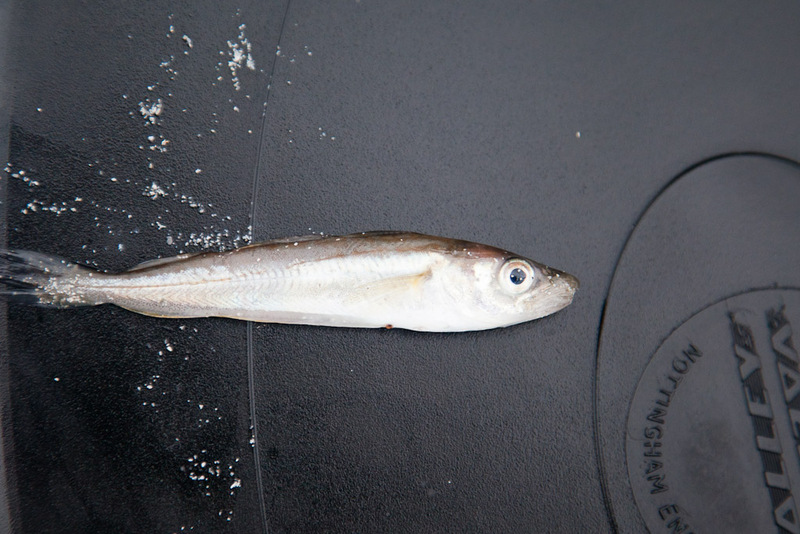 Since then I have not been so lucky but the mackerel seem to have been pretty thin this August and September. 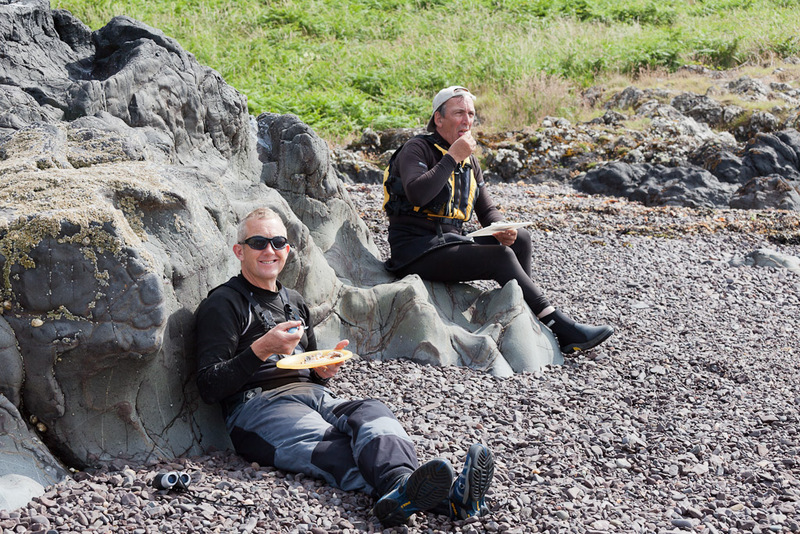 By the way, who says men can't multi-task? 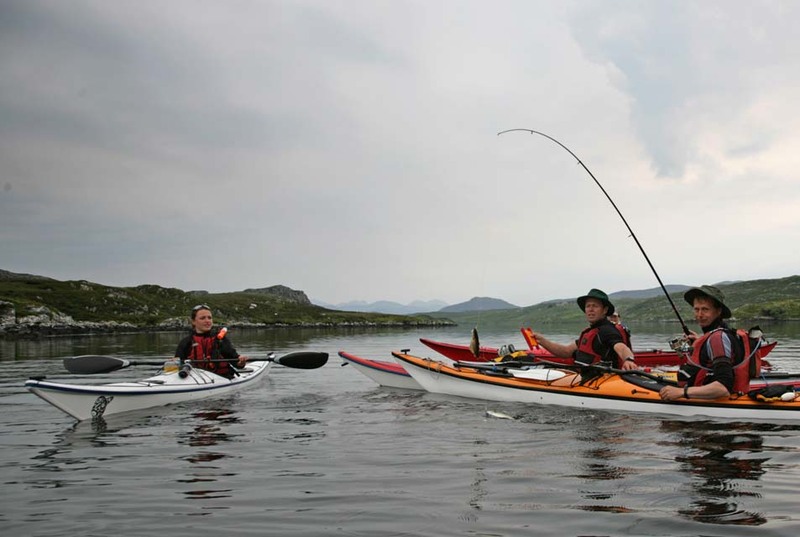 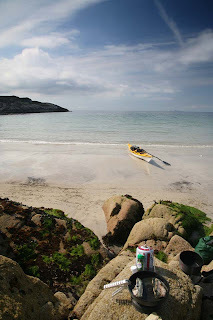 How about kayaking, sailing fishing and photographing just for starters? Seeing sand eels in the shallows is a good sign, as are diving terns and gannets. 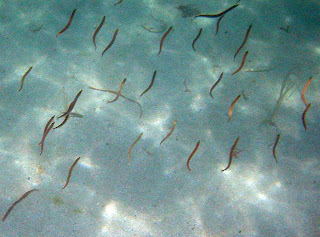 Sometimes shoals of white bait explode out of the water as the mackerel chase them. This one landed on my foredeck and was promptly employed as bait. 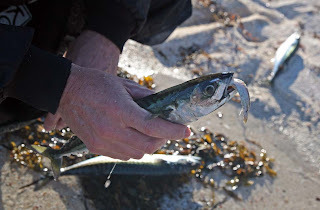 This mackerel was so greedy it took a hook even although it already had a sand eel in its mouth. 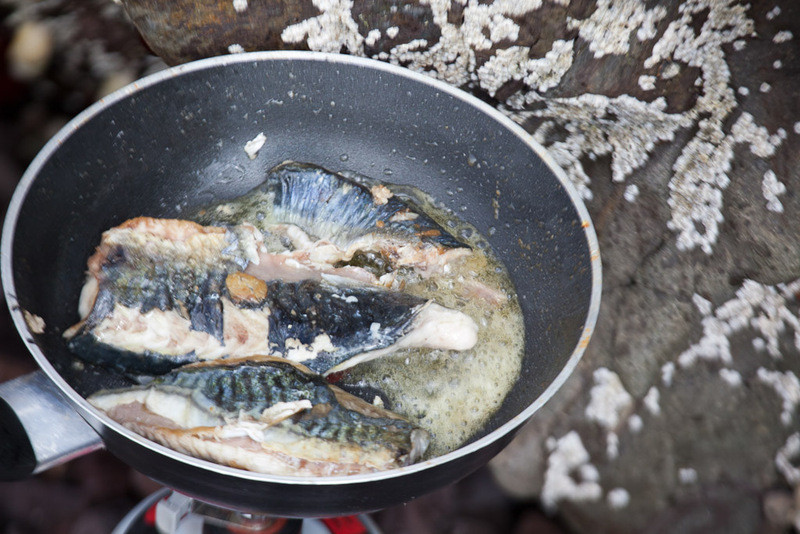 ...a little oil and a sprig of rosemary. Nothing is as tasty as eating a mackerel caught 15 minutes before!